The County Line Roast Organic Blend was blended and roasted for you by Taylor Maid Farms. The County Line Roast is certified Organic and makes a rich, earthy cup with dark chocolate notes & a lingering aftertaste. Their newest blend is an homage to the rural landscapes and rich agricultural history of their proud Sonoma County heritage. Really disappointed by this one. 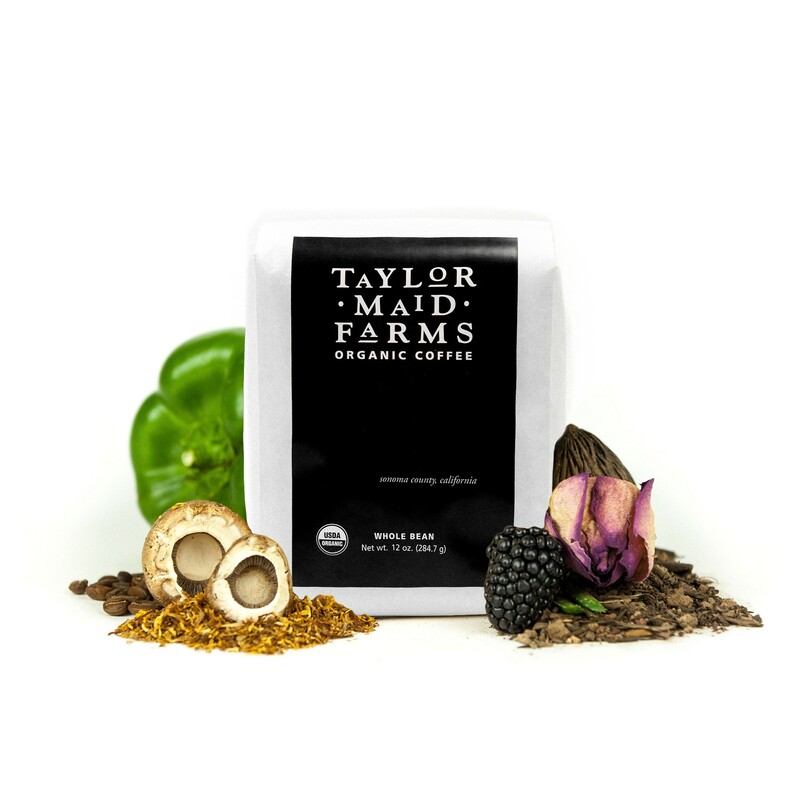 We'd had a blend from Taylor Maid Farms before and was hoping for a delish cup, but it really wasn't good at all. Not terrible but not outstanding. Good coffee but not excellent. It has a solid body with a traditional taste but lacks a broadness of flavors. Really enjoying this one - it is quite smooth, yet earthy with a lot of flavor. Coffee was roasted 7 days prior to being shipped out so wasn't fresh. This coffee is wonderful! The smell, the taste and the full body was of superior quality. Loved it! The flavor was superb, but the roast wasn't quite dark enough. Overall though it was a great cup of coffee! Definitely a chocolate-y hint in there. The first few sips were bitter, but that was at the very hot just-brewed temperature. Seconds later the bitterness fades. Certainly earthy. Not so drinkable warm or cold. this is excellent, equally good in both espresso and drip coffee - flavors are really well-balanced with both methods. more earthy/musty than some of the others I've tried - that's a plus for me. Thought this was a serviceable cup of coffee, which sounds like damning praise, but isn't meant to be. While I wasn't wowed by this, it did the job. I'm finding this a little bland and watery, brewing at a 1:15 ratio. It's too light a roast for my tastes. I really enjoyed this blend. I have gotten an Aeropress since my first bag and I think that the flavors really develops more when the coffee is brewed this way. I found it very smooth with a nice nuttiness. I don't think I like chocolate notes in my coffee. This one seemed a little too bitter. It just didn't wow me overall. Coffees I've liked before include expresso roasts with caramel notes. Very nice, hearty coffee. Very full feel. Wouldn't want it my everyday coffee, but I do like it. To my taste, a bit lighter than the the Zoka. I couldn't say I taste any chocolate, but it is substantial. This one is so mild to me that I hardly taste it. I don't think it is bad but there is nothing that stands out to me that is great. A little lighter than we normally drink. But overall was good. Thought it tasted a little flat. Really good! More neutral than the first one I received. I'm not sure which one I like better. Maybe the first one.... or something in between the two? Good depth and flavor, with nice finish. Just a bit lighter roast than we prefer...but very good. It was a little more acidic and not as rich as I was expecting. Good strong flavor not sure I could drink it plain but a splash of creamer made it delicious. Earthy with a sweet finish. Flavors are relatively mild. Delicious and smooth, love the subtle chocolate notes and earthy tones! This was just okay for me; it had a slightly acidic taste that I wasn't a huge fan of. This was fairly good, it didn't have quite the richness I am looking for in a coffee. Very nice. Looking forward to whatever is next for me. piping hot. I enjoy sipping on my drive to work and the first few minutes sitting at my desk. As this coffee cools, it tastes bitter and thin. The richness of a hot cup becomes watery and nearly unpalatable. Nothing special. Very little flavor. This coffee had some floral notes to the aroma. This is not a characteristic I desire. I found myself avoiding drinking this blend as a black coffee or espresso. This one was a little bright on the first cup. Or something. But pretty good. Country line is fine. Nothing exceptional. Just correct. Very little personality. Just objectively good coffee. I'd recommend as a daily driver. I liked the first one better, this one is just a bit weak for me. Both bags were great taste and flavor! Thank you so much! Sorry for the delay in responding. I liked the blend better than average, but I am used to a darker roast coffee. I do want to try different coffees because I have stuck with just a few for a long time. I am really enjoying this coffee! I tend to like dark roasts. This coffee was great. My wife and I normally grind and brew our coffee daily, but this coffee in a French press was awesome. To me, it had a lot of chocolate and black cherry notes, which were great, but I'm interested to try something new. I also tend to be drawn to coffees with medium to lower acidity levels. it was very good and it was organic. Full bodied, yet smooth and delicate. This is our favorite coffee so far. Great coffee! You guys definitely nailed it! Please send me more coffee like this! One of my favorites so far! I loved the deep, earthy flavor. First shipment from Mistobox, and I really enjoyed it! I will definitely order this again! Fantastic. Smooth, earthy, chocolate feel .one of the best coffees I have tried. I have to preface this review with a note that this coffee was used in a drip machine. I have not tried this coffee yet with a French press. With that said, this is an OK coffee for a drip machine. Not a bad flavor, very mellow, easy drinking, but I prefer darker roasts. Smooth and balanced. Made great espresso and evoked memories of Florence, drinking cappuccinos on the cobblestone boulevard. Solid, earthy, hints of chocolate and overall a GREAT coffee. Bravissimo! Not my favorite coffee. The robust, full body is nice, but the flavor profile is not what I personally jive with. It's too earthy and murky; I'm finding that I much prefer brighter, fruity notes. Overall a great cup of coffee! Full bodied and robust. really good. Great coffee with great flavor! One of our favorites! Very bold coffee, really stands out especially when used in a latte or other milky beverage. Smooth anytime sipper. However, the finishing notes/flavors tend to over power the beginning flavors. Great coffee for anyone who loves caramel flavors. We enjoyed this coffee a lot. It is very smooth going down and holds a lot of flavor. I am enjoying the darker, full body coffees the most thus far. The aroma was amazing and the brewed taste was very nice. Enjoyed first cup, natural and nutty. Picked up the smokiness, but neither my wife nor I were able to pick up the chocolate notes. That was disappointing. Both of us gave it a 4. This is really good coffee. It has a bright, alive flavor that made me want more. Still has a bit of an acidic taste. Good flavor. LOVE this coffee! Very smooth and the chocolatey undertones are amazing. I am really enjoying this blend. Not sure how to explain the different aspects since I am newer to tasting such higher quality roasts. As I taste other brands I will be able to do a better comparison. Another good coffee. I'd give it a 2.5 stars on a standard drip brew. But as my curator mentioned, it is much better in a french press. And I agree. It seems like a very stubborn coffee when it comes to brewing. It needs to be immersed in the coffee grounds for at least 4 minutes. A drip feed doesn't do that. The rating goes from 2.5 to a 3.5 if you focus on a good brew. Yowza! Very excellent and in contention to be my personal "brew". Love the strong, rich, but balanced and flavorful taste and aroma. Best of all is the pleasant aftertaste. Well done, Taylor Maid Farms! OK but just not what I'm looking for. Just ok. It is a good quality coffee but not what I would consider a premium coffee. One of the best. Strong yet smooth flavor. All around enjoyable. Very happy with the flavor and roast. This is much closer to what I consider to be a good cup of morning coffee. Something that I truly look forward to in the morning. Bold, rich, and very satisfying!Thanks. Good flavor but could have been roasted more darkly. Fantastic morning coffee! Fantastic aroma too!